Longstreet, Lt Gen James (1821-1904), Confederate corps commander whom Lee called his ‘old war-horse’. He was commissioned from West Point in 1842 into the infantry, and was badly wounded in the Mexican war. He resigned from the US army to become a Confederate brigadier general in 1861, rising rapidly through division and corps command to emerge, after the death of Jackson, as Lee's principal lieutenant. He is the preferred scapegoat of ‘lost cause’ romanticists because he was a reluctant secessionist, because he delayed Pickett's Charge at Gettysburg, because he was a friend of Grant and joined the Republican party after the war, and because he criticized Lee in his memoirs. James Longstreet was a career soldier who served as a lieutenant general in the Confederate States Army (CSA) during the U.S. Civil War. Longstreet grew up in Georgia and Alabama, graduated from the military academy at West Point (1842) and served the United States with distinction in the war with Mexico (1846-48) under Zachary Taylor and Winfield Scott. (born , Jan. 8, 1821, Edgefield District, S.C., U.S. — died Jan. 2, 1904, Gainesville, Ga.) U.S. army officer. He graduated from West Point but resigned from the U.S. Army when South Carolina seceded. Appointed brigadier general in the Confederate army, he fought in the battles of Bull Run, Antietam, and Fredericksburg. He was second in command to Robert E. Lee at the Battle of Gettysburg, where his delay in attacking contributed to the Confederate defeat. He later directed the Confederate attack at Chickamauga. He was badly wounded in the Battle of the Wilderness but later resumed his command. He surrendered with Lee at Appomattox Court House. He later served as U.S. minister to Turkey (1880 – 81) and commissioner of Pacific railways (1898 – 1904). Born in Edgefield District, South Carolina, January 8, 1821, the son of a farmer, Longstreet spent his early years in Augusta, Georgia. On the death of his father he went with his mother to Somerville, Alabama. Corps commander James Longstreet made three mistakes that have denied him his deserved place in Southern posterity: He argued with Robert E. Lee at Gettysburg, he was right, and he became a Republican. He entered West Point from Alabama, graduated in 1842, and was wounded at Chapultepec in Mexico. James Longstreet was born on January 8, 1821 in Edgefield District, South Carolina, the son of planter James and Mary Ann (Dent) Longstreet. Raised by his uncle in Alabama and Georgia, the young James entered West Point and graduated fifty-fourth in a class of sixty-two in 1842. He was assigned to various military posts in Missouri and Louisiana until the outbreak of the War with Mexico in 1848. Serving under General Zachary Taylor, Longstreet saw combat at Palo Alto, Resaca, and Monterrey. He participated in several other battles including the decisive Battle of Chapultepec where he was wounded. American soldier, lieutenant-general in the Confederate army, was born on the 8th of February 1821 in Edgefield District, South Carolina, and graduated at West Point in 1842. He served in the Mexican War, was severely wounded, and received two brevets for gallantry. In 1861, having attained the rank of major, he resigned when his state seceded, and became a brigadier-general in the Confederate army. James Longstreet was a Confederate General who served as Robert E. Lee's second-in-command for most of Lee's tenure as commander of the Army of Northern Virginia during the American Civil War (1861–1865). Longstreet fought in many of the most important battles of the conflict and ended the war as a respected figure. Lee affectionately called him "my old war horse," while his soldiers nicknamed him "the old bulldog" and "the bull of the woods." In the postwar period, however, Longstreet drew criticism for his support of Republican policies during Reconstruction (1865–1877), and controversy erupted over his conduct years earlier at the Battle of Gettysburg (1863). As southerners in general and Virginians in particular enshrined Lee's memory, Longstreet became a scapegoat for Lee's failures and the central figure in the emergent Lost Cause mythology white southerners developed to explain the loss of the war. An elderly man sat in his parlor, his eyesight too poor to read the newspaper, listening to his son voice the words written by Reverend William Pendleton, Robert E. Lee's head of artillery during The Civil War. The prose was harsh, some would say vicious, as it repeated the charges he, Jubal Ea rly, John Gordon, and others leveled against General Longstreet, accusing him of being insubordinate to the beloved Robert E. Lee and a traitor to the Southern people. "Liars! Liars!" he shouted out, and then, "the light of battle passing once more into his eyes," he stood and defended the General against these outrageous accusations, speaking to no one in particular except his son, who had heard these words before. Even in death, it seemed, Longstreet knew no rest from the controversies that surrounded his tenure as a soldier. The Longstreet Society is dedicated to the celebration and study of the life of Lieutenant General James Longstreet, CSA.The Longstreet Society is dedicated to the celebration and study of the life of Lieutenant General James Longstreet, CSA.The Longstreet Society is dedicated to the celebration and study of the life of Lieutenant General James Longstreet, CSA. A collection of documents and essays related to James Longstreet. A veteran of the Mexican War (1846-48) and a Republican politician, James Longstreet was one of the most prominent and controversial figures of the Civil War (1861-65).A veteran of the Mexican War (1846-48) and a Republican politician, James Longstreet was one of the most prominent and controversial figures of the Civil War (1861-65).A veteran of the Mexican War (1846-48) and a Republican politician, James Longstreet was one of the most prominent and controversial figures of the Civil War (1861-65). The words resonate through Confederate history like an unwelcome truth. As General Robert E. Lee made preparations for an assault on the center of the Union line at Gettysburg on July 3, 1863, his senior subordinate, Lieutenant General James Longstreet, voiced objections. At one point in the discussion, Longstreet recounted his experience as a soldier and then stated, "It is my opinion that no fifteen thousand men ever arranged for battle can take that position. "The words resonate through Confederate history like an unwelcome truth. As General Robert E. Lee made preparations for an assault on the center of the Union line at Gettysburg on July 3, 1863, his senior subordinate, Lieutenant General James Longstreet, voiced objections. At one point in the discussion, Longstreet recounted his experience as a soldier and then stated, "It is my opinion that no fifteen thousand men ever arranged for battle can take that position. "The words resonate through Confederate history like an unwelcome truth. As General Robert E. Lee made preparations for an assault on the center of the Union line at Gettysburg on July 3, 1863, his senior subordinate, Lieutenant General James Longstreet, voiced objections. At one point in the discussion, Longstreet recounted his experience as a soldier and then stated, "It is my opinion that no fifteen thousand men ever arranged for battle can take that position." Born in South Carolina in 1821, James Longstreet was an 1842 graduate of West Point. During the Mexican War in 1847, he experienced extensive front line combat service in both the northern and southern theaters of operations, where he led detachments that helped capture two Mexican forts guarding Monterey, and in street fighting in the city. At Churubusco, Longstreet planted the regimental colors on the walls of the fort and saw action at Casa Marta, near Molino del Ray. On August 13, 1847, Longstreet was wounded during the assault on Chapaltepec while "in the act of discharging the piece of a wounded man. 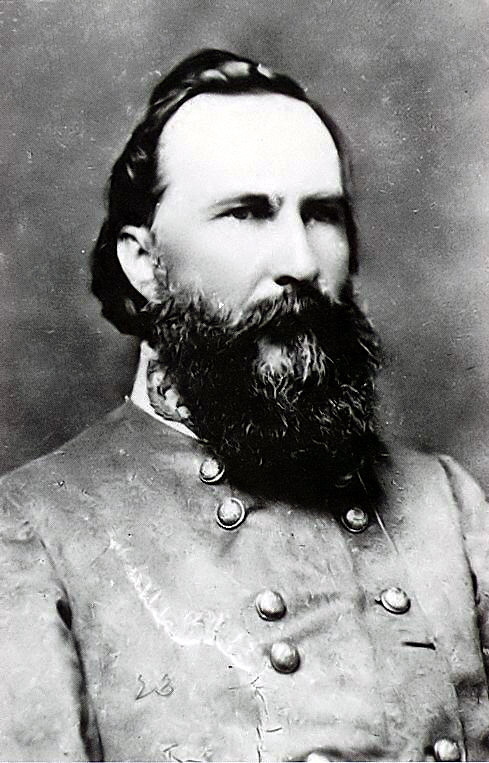 James Longstreet was born the fifth child of James and Mary Ann Dent Longstreet, on January 8, 1821, in the Edgefield District of South Carolina. His mother had traveled to her mother-in-law&#039;s home for his birth. Both of his parents, owners of a cotton plantation near present-day Gainesville in the Piedmont section of northeastern Georgia, were descendants of families dating to the colonial period -- James born in New Jersey, Mary Ann in Maryland.